AMES, Iowa – Vincent can’t jump just yet, but it’s probably only a matter of time. 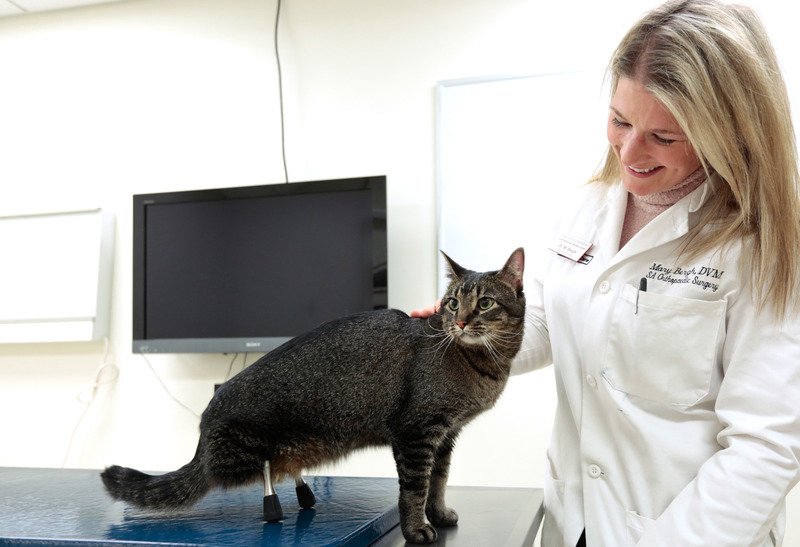 The 3-year-old domestic short-haired cat recently paced across the floor of an exam room at Iowa State University’s Lloyd Veterinary Medical Center with the legendary curiosity long associated with felines. He took in his surroundings and strolled over to the base of an exam table. And that’s when you could see it – just for a moment – in the way Vincent tensed his body and set his gaze toward the ceiling. He wanted to jump. He wanted to scale the exam table and find out what the view was like from the top. 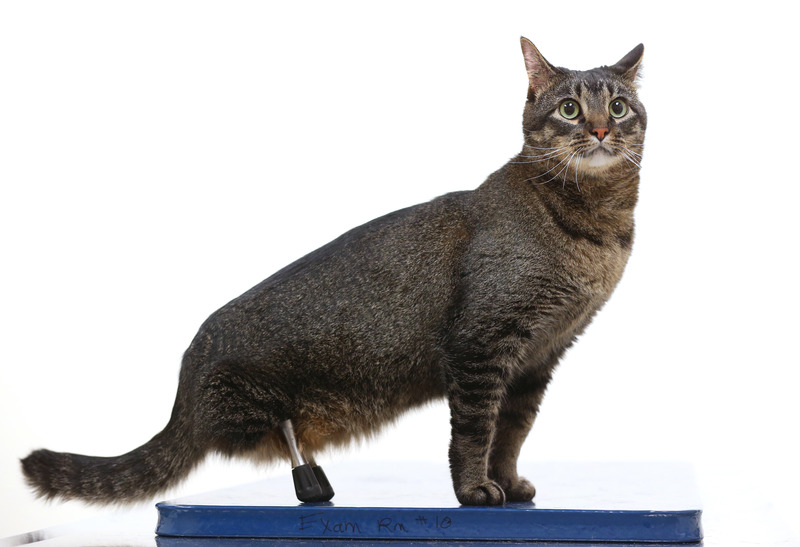 Vincent, a 3-year-old domestic short-haired cat, received prosthetic titanium-alloy hind legs at Iowa State. Photo by Christopher Gannon. Larger image. “I anticipate that he’ll be jumping and doing really normal cat things very soon,” said Dr. Mary Sarah Bergh, the veterinary orthopedic surgeon who attached Vincent’s prosthetic legs and has overseen his rehabilitation. Bergh, an associate professor of orthopedic surgery in the ISU Department of Veterinary Clinical Sciences, estimated that only a couple dozen animals in the world have received the sort of prosthetics Vincent now has. His recovery hasn’t always been easy, due in part to how little data is available to guide his rehabilitation. But the overall arc of Vincent’s recovery shows undeniable progress, a testament to innovative veterinary medicine and the dedication and love of his owner. “I took one look at him and fell in love,” Jones said. It was Emily Jones, Cindy’s daughter who attends veterinary school at Iowa State, who first thought that Bergh might be able to help. “He’s been through a lot more than most cats have to go through,” she explained. When Vincent was brought to the animal shelter as a kitten, his hind legs were missing below the midway point of his tibias, or shinbones. Bergh said she couldn’t ascertain exactly how he ended up in that condition. Dr. Mary Sarah Bergh examines Vincent during a recent visit to the Lloyd Veterinary Medical Center. Photo by Christopher Gannon. Larger image. Bergh worked with BioMedtrix, a veterinary orthopedics company that donated time and materials to the project, to design implants that could be inserted into the femur bones of Vincent’s legs and pass through his skin. The design of the implants allows for Vincent’s bone to grow onto the titanium shafts to support his weight, she said. But the titanium shaft is exposed to the environment, which puts Vincent at risk for infection and is an ongoing challenge she and Jones have worked hard to overcome. Vincent’s first surgery occurred in February 2014, and he was taking his first steps within days of the procedure. A second surgery followed earlier this year in February, and he’s undergone subsequent treatments to gradually lengthen the prosthetic legs. Eventually, they’ll be as long as the hind legs of an average house cat to normalize his gait. At that point, he should be able to get around with little difficulty – even if he wants to try jumping. Bergh said the experience with Vincent may help her and other veterinary orthopedic surgeons expand and improve the use of implants for animals in the future. She called this kind of procedure an “emerging field” that’s rare in veterinary medicine, but Vincent’s case may help answer some questions and make implants a more practical solution. “His bone is looking great. The implants are stable, and he’s walking really well on them,” she said. “I couldn’t be happier with how he’s doing at the current time. Vincent, a 3-year-old domestic short-haired cat that received prosthetic legs at Iowa State, is making a strong recovery. In fact, his doctor thinks he might start jumping soon.